Or, that the elderly Bokkie Potgieter was dealt a similar fate as he tended his small, KwaZulu-Natal holding. Potgeiter was butchered during the October “Black Monday” protest, which was a nation-wide demonstration to end the carnage. Internationally reported as well were the facts of Sue Howarth’s death. The 64-year-old pharmaceutical executive was tortured for hours with … a blowtorch. The South African state’s stout indifference to the plight of whites does not exist in a void. Witness the steady, anti-white venom the dominant-party cobra-head, the ANC, spits out. 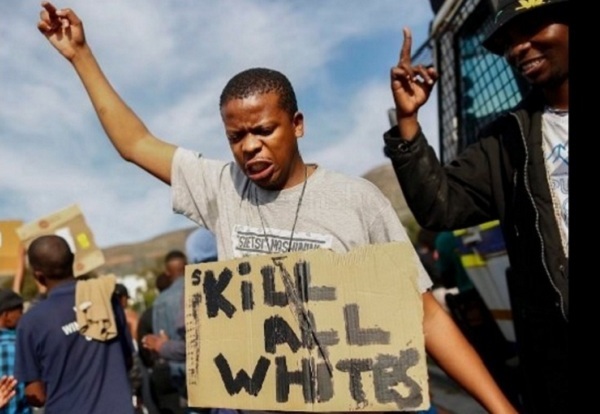 “The de facto situation is that whites are under criminal siege explicitly because of their race,” writes a South African historian, cited in “Into the Cannibal’s Pot: Lessons for America from Post-Apartheid South Africa” (2011). For what they’ve achieved and acquired—and for the original sins of apartheid in South Africa; slavery in America—whites are the objects of envy and racial enmity. Why Does The New York Times Hate White People?